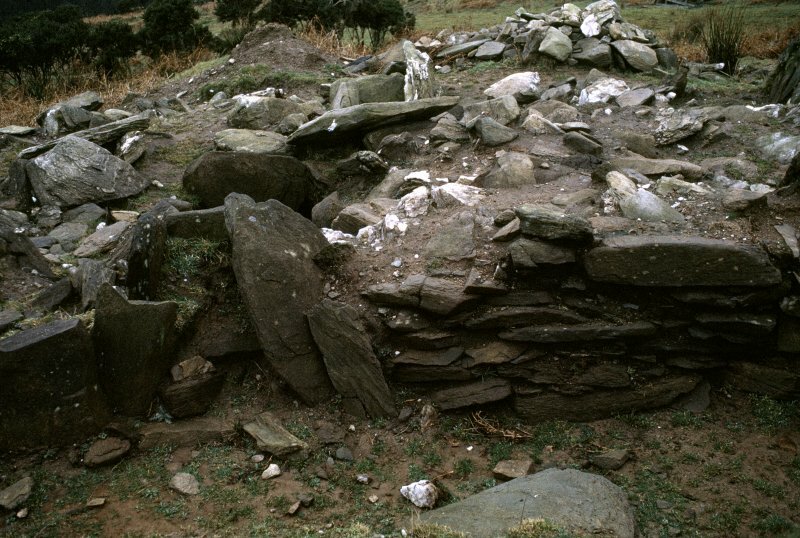 General view of Glenvoidean cairn, from the N.
Pots in axial chamber. An image from the Buteshire Natural History Society archaeology photograph album, held at Bute Museum. Glenvoidean chambered cairn. View from NW. 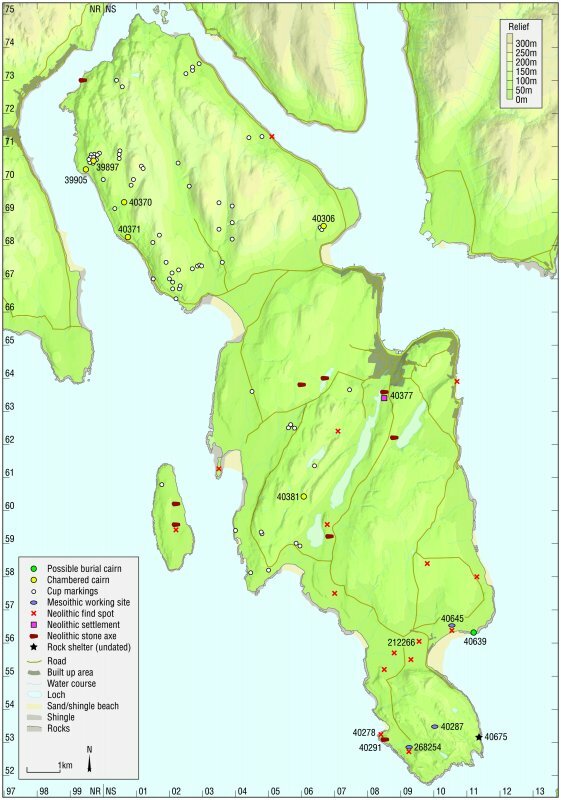 General view, taken from the N.
Map - Distribution of Early Bronze Age sites and artefacts. View of Glenvoidean cairn, from the N.
Forecourt with collapsed facade. An image from the Buteshire Natural History Society archaeology photograph album, held at Bute Museum. NR 997 705. 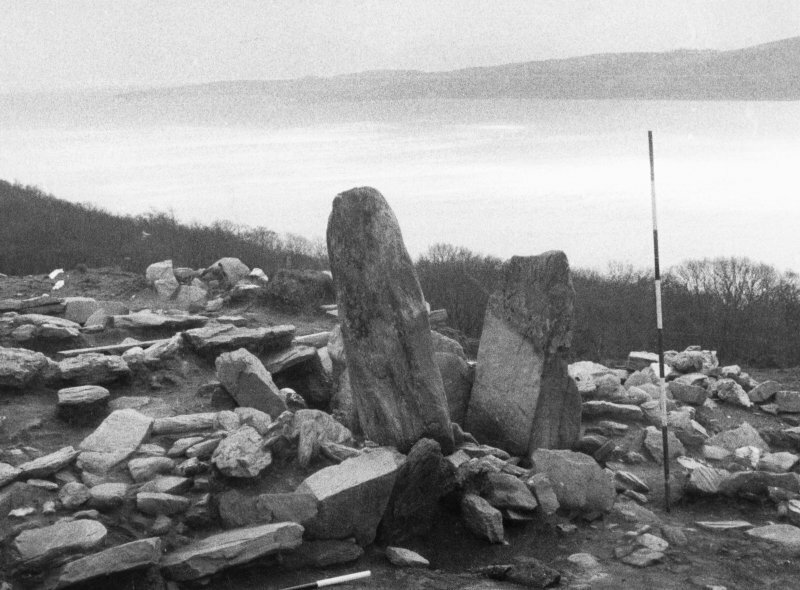 Prior to excavations carried out between 1963 and 1971 by Miss Marshall and Mrs Taylor, the much ruined chambered cairn at Glenvoidean appeared only as a grass-covered platform set on a steep hillside. 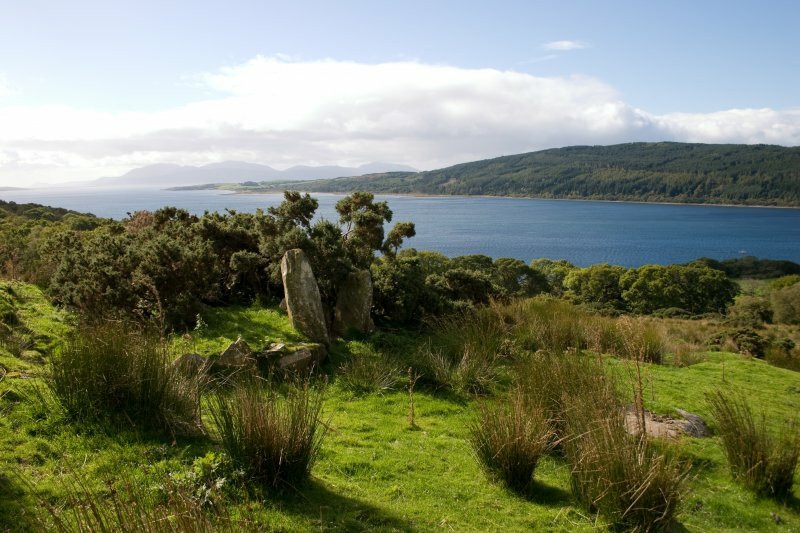 The cairn measures 42ft N-S, 22ft wide at the N end, where there is a flattish facade, narrowing to 16ft at the S end. The E side and S end of the cairn are relatively well-preserved, edged by a wall-face still several courses high in places; the downhill (S) side is too ruined to trace accurately. The excavations revealed a two compartment axial chamber, behind which was a small, probably medieval, corn-drying kiln. Two lateral chambers, entered from opposite sides of the cairn, were also found. 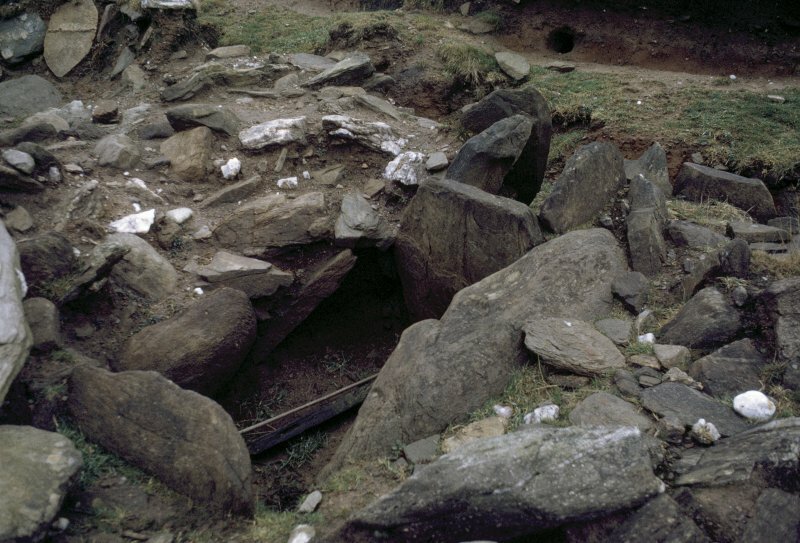 Inserted into the cairn was an unusual Bronze Age cist, divided into two tiers by a large horizontal flagstone. 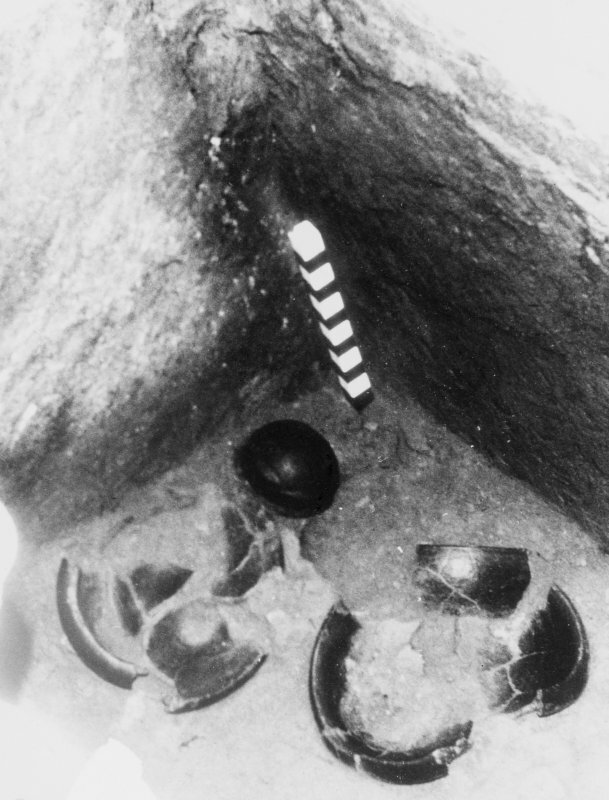 The remains of burials were found in both compartments, the upper burial being contained in an inverted enlarged food vessel. 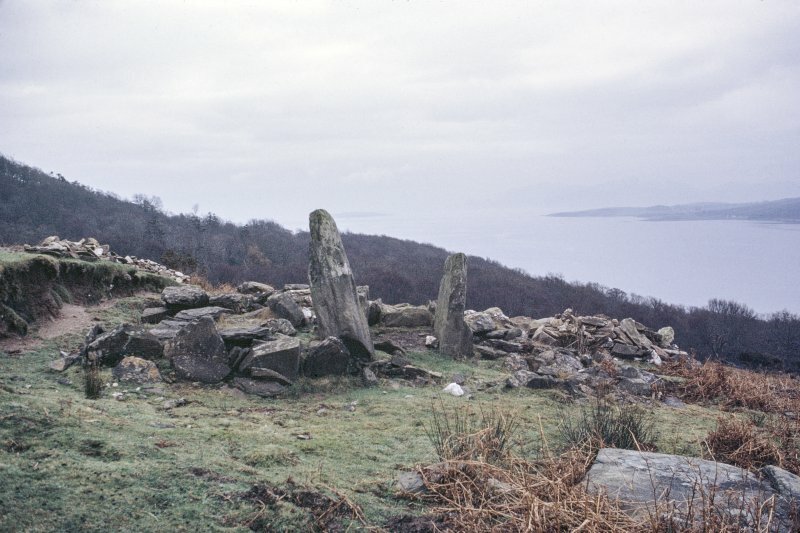 The excavators suggest that originally both lateral chambers had been together under a single round cairn which had only later been joined up with the front chamber to form the present trapezoidal Clyde-type cairn. Patches of burning were seen round the outside of the cairn and under the kerb, which is built in so many different styles as to suggest that it had been built in several different stages. A radiocarbon date of 2910 +/- 115 bc was obtained from a sample of carbon found in a primary position under the W slab of the main axial chamber. 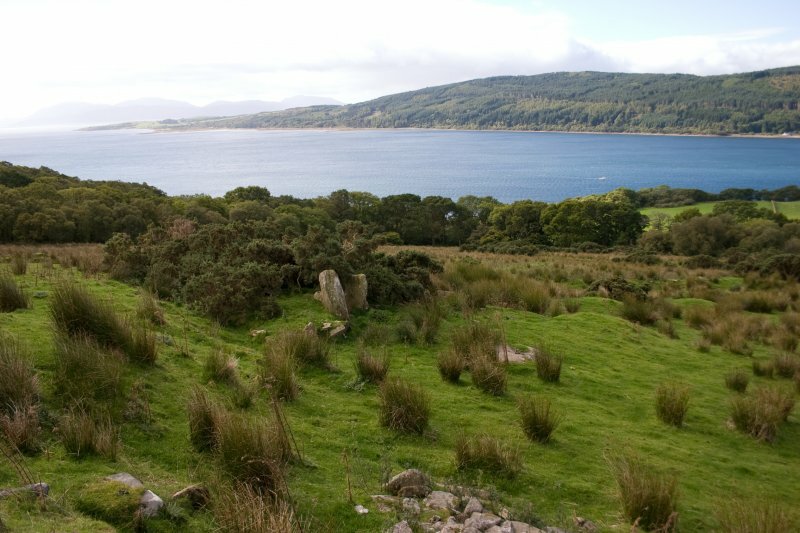 The artifacts, including neolithic pottery and flint flakes, found during the excavations, are in Bute Museum. Current Archaeology 1972; A S Henshall 1972; D N Marshall 1969. NR 9971 7057 A chambered cairn as planned and described in the previous information. Visited by OS (B S) 21 October 1976. 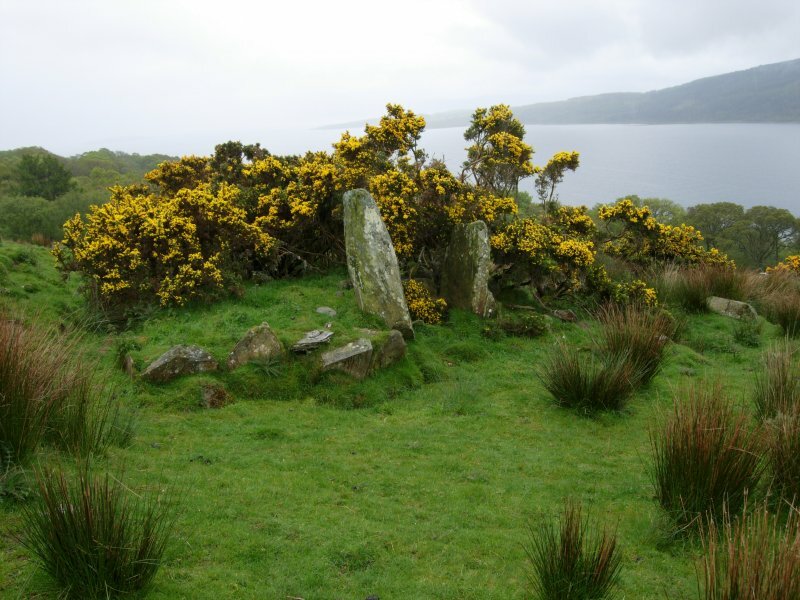 This chambered long cairn, which has been built on a platform or terrace on a steep SW-facing slope 400m SE of Kilmichael farmsteading, was largely obscured by dense gorse on the date of visit. Features that were visible included the axial burial-chamber, a portal stone and part of the facade at the N end, two lateral burial-chambers, one entered from the W side of the mound, the other from the E, and trenches and spoil-heaps from excavations. Neither the bronze age cist nor the medieval corn drying kiln were identified. Two cup marks, both measuring at least 50mm in diameter and 10mm in depth, are visible on one of the former roofing slabs of the axial burial-chamber, which now lies 4m to the NW of the chamber.